Saturday morning we woke up, took a shower got dressed and into the bar for a Cappuccino and Brioche. The B&B provided for coupons to be used in the bar next door and really we do not need any more in the morning. Since we were so close to the Vatican which we only saw from outside we decided to go there first and have a look inside, inside the St. Peter's Basilica. Although I've been in it before I got goosebumps again, so big, so beautiful, so ... (words can not describe my feelings). I can really understand people in the past, but also today are so impressed by it's greatness and beauty that they feel closer to God, or whatever they believe. In one of the chapels I took a moment for myself to pray for my mother; she died last July, only 60 years old, because of cancer. 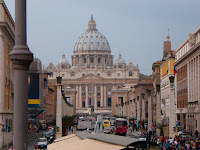 After the visit to the St. Peter we walked in a straight line to the Castel Sant'Angelo. 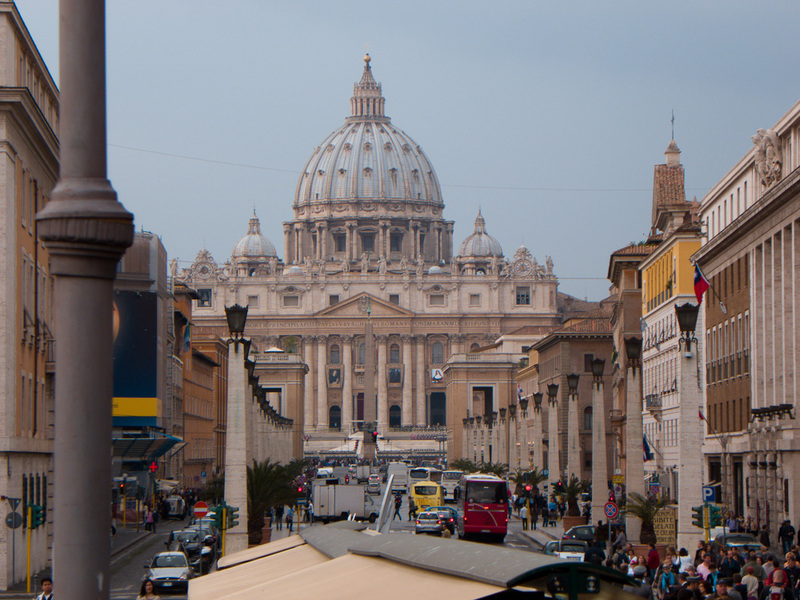 Walking down the Via della Conciliazione you keep a fantastic view at the St. Peter and it's square behind you (one has to look around though). Nowadays the Castle is maybe best known for it's role in Dan Brown's Angels & Demons in stead of it's original role as mausoleum for Hadrian(us) and later as Papal fortress, and even prison. Since we did not want to drawn our kids with too much history, culture and musea on their first city trip we moved on. Next stop: Round Table. Saturday in all of Italy Round Table Italia supported the Italian Cystic Fibrosis Research Foundation with raising money for research by selling the flower that the Italian CF Foundation uses as their symbol: the cyclamen (also known as sowbread or persian violet). If we wouldn't have been in Rome I would've been selling these flowers with my friends and fellow tablers of RT 64 Varese.The least I could do is to pay a visit to our Roman friends of RT2 Roma. They were selling their flowers on the banks of the Tiber in one of Rome's most exclusive sport associations. 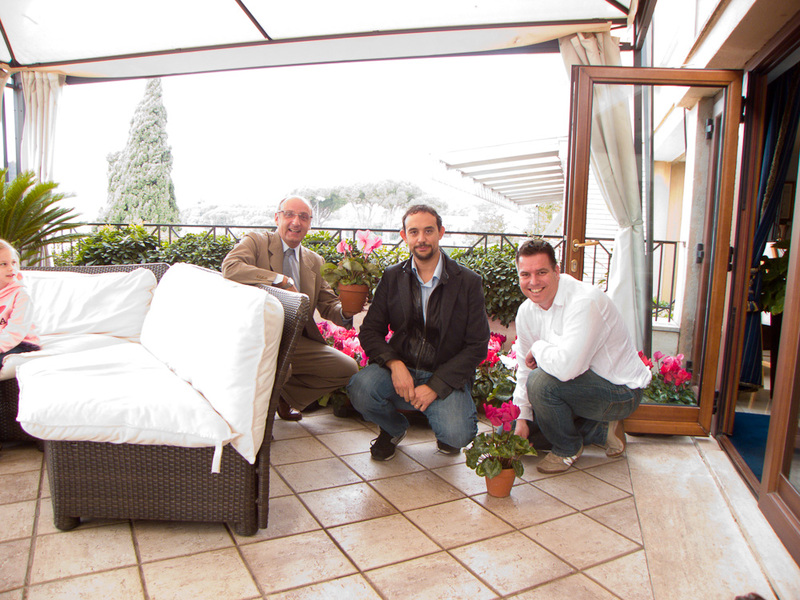 I posed with Lorenzo and Federico and their stack of cyclamens. Thank you again Lorenzo for the address of the trattoria we visited that same evening. Lunch time and since we were close to Piazza del Popolo I held my noose in the wind and this time we ended up in a very tiny restaurant, not so cosy, but since I saw some locals having lunch we stepped inside. 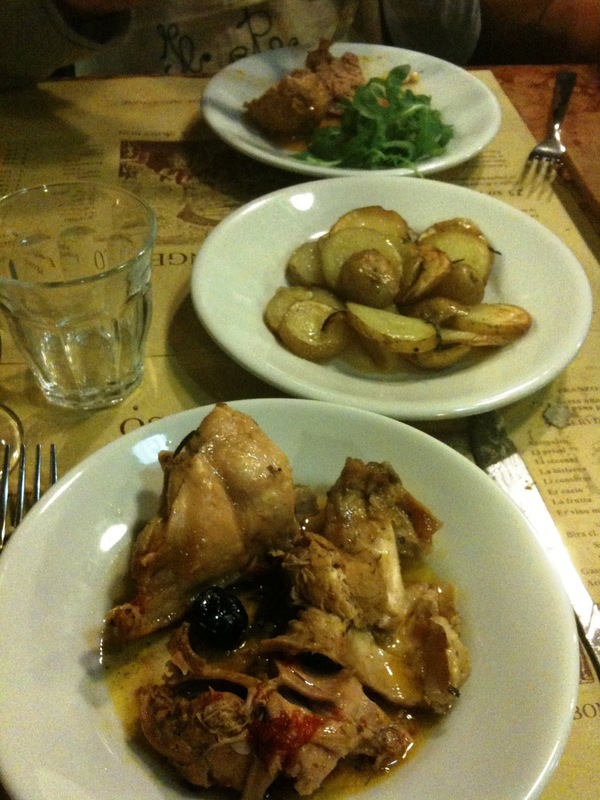 No regrets, a good honoust meal for a very decent price: Ristorante Cesaretto! 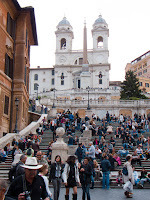 After our well deserved lunch we visited Piazza del Popolo and then took the subway into the centre, it was time to visit Piazza Spagna and the Spanish Stairs. 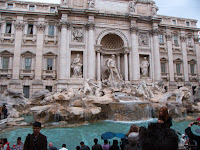 Just one of these beautiful sites in Rome you have to visit your first time in Rome. 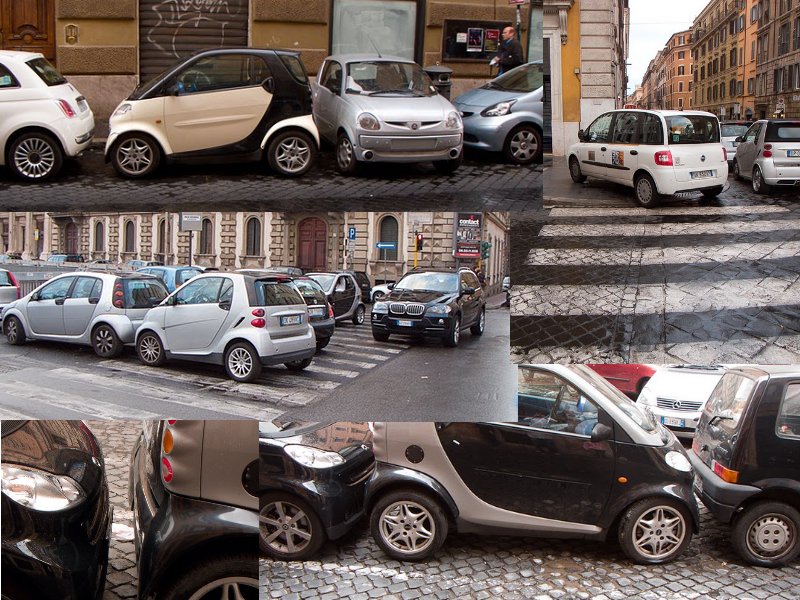 Even if it's crowded with tourists and the usual Roman, Eastern European and Asian entrepreneurs you see everywhere in Rome. But five Euro for 10 blackened chestnuts (castagne) is really too much, SPQR, Sono Pazzi Questi Romani! And then.... it started to rain. The predictions were right. Damn, but we already realized we had to come back and the best way to make sure you come back to Rome is to throw a coin in the Trevi Fountain which is just 2 blocks away from Piazza Spagna. So through the rain towards the Fontana di Trevi. Vodafone just organized a Guiness Book of Records event (despite foursquare, facebook and twitter I didn't know that), 1561 coins where thrown simultaneous in the fountain. But they all threw 1 cent coins, at least the four of us donated more then one Euro. 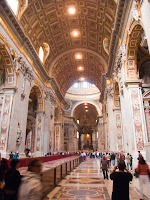 I did it in 1989 and I came back, so we have good hope that we will all return to Rome in the future. Meanwhile the rain got heavier and heavier so we fled indoors. Back in the streets (the rain slowly stopped) we decided to walk towards the Pantheon which just closed in front of our nose for the regular church service. So we wandered along where arrived at Gelateria La Palma which I recalled was recommended by a friend of us. So while the sun was reappearing from behind the clouds we enjoyed a real Italian ice cream. Delicious, one problem though you will have visiting La Palma, choice, there are just too many tastes! 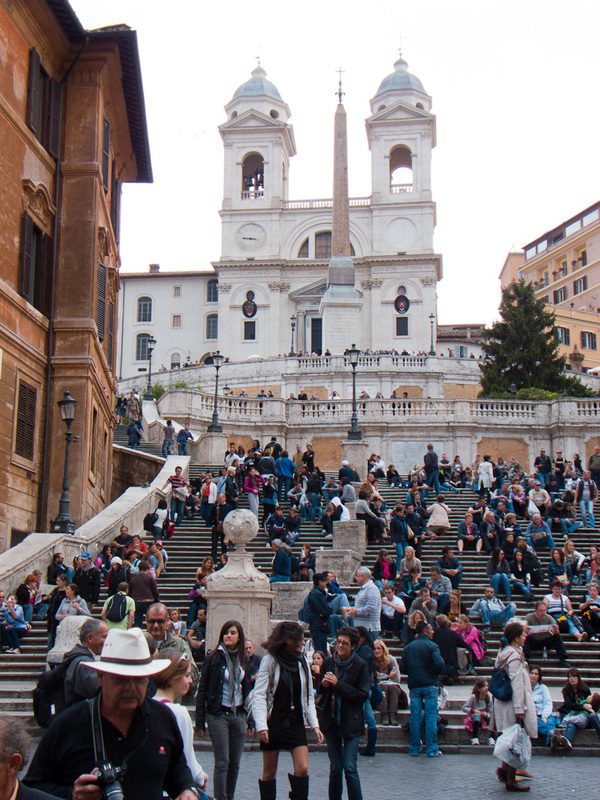 After this culinary break we just wandered through Rome knowing we had to pass some bus stop or subway station soon. 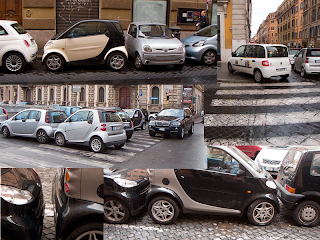 On our way back I noticed some typical situations of Roman parking. I'm very happy to know that you had a good dinner at Osteria dell'Angelo.